(Nanowerk News) Space is the most hostile environment that we know of. The lack of pressure would bring our bodily fluids to the boil. Oxygen, heat, food and water are not present either. Yet people live there - on the International Space Station (ISS), thanks to the life support systems that are installed there. For extended space missions, such as a trip to Mars, the functional capability of these technologies is also crucial. Researchers at the Technical University of Munich (TUM) have developed software that can be used to simulate the systems. In the movie, "The Martian", the astronaut Mark Watney is left stranded alone on Mars. It quickly becomes apparent how dependent his survival is on the life support systems. He needs oxygen, drinking water, food, normal pressure and heat. None of which the Red Planet can provide him with. The conditions are even more extreme in space. Nevertheless, NASA has long-term plans to send astronauts on missions, lasting several weeks or months, to an asteroid or even to Mars, for example. 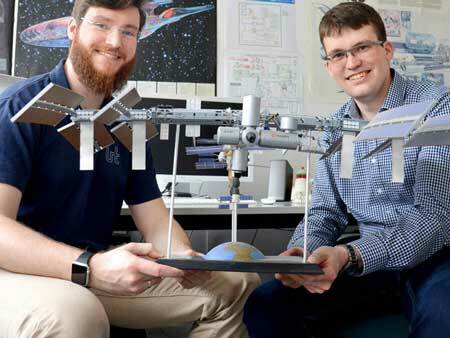 Claas Olthoff (left) and Daniel Pütz with a model of the International Space Station. "A crucial question must be posed here: do the life support systems run stably over such a long period?" explains Claas Olthoff, Research Associate at the TUM Institute of Astronautics. Interactions with other systems or even unforeseen disruptions and failures must be taken into account. Since 2006, scientists at the institute have been working on the "Virtual Habitat" software, which can calculate these problems precisely. "V-HAB" allows researchers to simulate models, ranging from a spacesuit right up to a ten-man lunar base crew. Even missions lasting several years are calculated. The advantage of the tool: numerous functional life support technologies have already been programmed here and interactions between different systems can be calculated. A core element of the software is a model of the human body because humans produce carbon dioxide and urine, among other things. These are the raw materials that the life support system can in turn process. Methane gas and water are produced from carbon dioxide after a chemical reaction with hydrogen. The life support system pumps the methane overboard, the water is then available to the astronauts again and can be used as drinking water or to produce oxygen by electrolysis. Urine can also be converted into drinking water. These interactions between man and machine are very complex and "V-HAB" tries to map as many of them as possible. The software is constantly being developed and supplemented with models of diverse systems; from a radiator that cools the spacesuits to algae cultures required to produce food. During a study visit at NASA’s Johnson Space Center in Houston, master's student, Daniel Pütz, had the opportunity to simulate the installation of a new life support system on the International Space Station (ISS) using "V-HAB" and therefore program and test other functions along the way. Both an American and a Russian life support system are currently installed on the ISS. Now a European version is about to be added. Airbus developed the Advanced Closed Loop System (ACLS) for the European Space Agency (ESA). Thanks to a close connection between the individual subsystems, it is more compact and therefore saves space. It will be brought to the ISS with a Japanese spacecraft in 2017 and installed in the American laboratory module, Destiny, for test purposes. But there are always risks with a new system, too, explains Olthoff. Because it can affect or even disrupt the existing systems. As ACLS uses a different technology for CO2 filtering than the systems already installed, there is a particular risk here of more water vapor reaching the air. Humidity must be between 40 and 60 percent on the space station. A higher figure would be dangerous because mold could form in poorly ventilated areas. As Pütz discovered from the simulations, the filtering systems on ISS can easily make adjustments for the higher levels of humidity that the system produces. Even the other values were deemed acceptable. NASA already used "V-HAB" to make calculations for an asteroid mission. Maybe the software will be used in the future for simulate more long-term missions. And perhaps give the real "Martians" a better chance of survival in the process.